Sorry the blog posts have been scarce lately. Matt and I both have been concentrating on saving extra money and being frugal eating at home, which means no nice dinners or gourmet home cooking! I’ve pretty much been sticking to easy home recipes with ingredients that I already have on hand, and most of which I’ve already blogged about! But on Friday Matt decided to splurge a little and took me out to a really awesome Mexican place, Tolache, on the Upper East Side that we had never tried before. It turned out to be the perfect Friday night meal: Good strong margaritas and flavorful authentic Mexican food! We actually haven’t gotten real Mexican food in a while. Mexican is one of my all-time favorite cuisines, but usually when I crave it I’m craving more of Tex-Mex food, like a huge burrito stuffed with veggies and shrimp and smothered with cheese and sour cream. Usually I’ll get my fill at Chipotle or Blockheads or one of the many places in East Harlem, but I wasn’t looking to go overboard and feel like a whale for the rest of the weekend. Going to Toloache reminded me that there is a whole other side to Mexican cuisine aside from smothered burritos and enchiladas, and that it can actually be very refined, fresh and complex. We got to Toloache pretty late in the evening, around 10 PM, and the place was still slammed (that’s always a good sign). Fortunately they were able to give us a table at the back of the restaurant. Walking through, we realized the restaurant is deceptively large, and opens up into a second large dining space in the back. Since they were so busy, service was a little slow but the employees made up for it with their eagerness and sincerity! All of the employees were constantly topping our water off and asking if we were doing alright, which we were. We both ordered margaritas (Matt’s had cucumber and jalapeños whereas mine was a regular) and they turned out to be pretty strong. I was happy sipping one for the duration of our meal. For an appetizer we decided to order the tuna ceviche and lobster tacos. 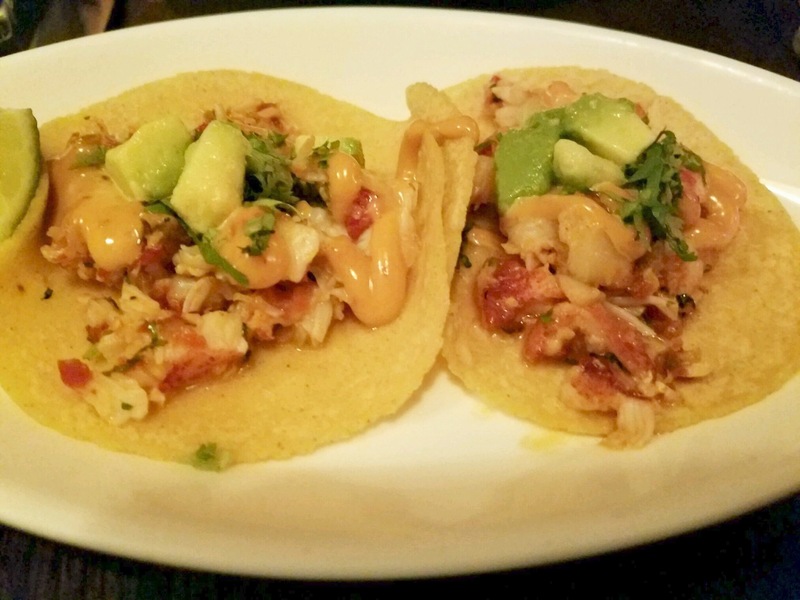 The lobster tacos are the most talked-about thing on the menu, so of course we had to try. Sure enough, the tacos were superb. Two came in an order, and the tortilla was warm with succulent sweet lobster meat topped with fresh avocado and an addicting chipotle sauce and garnished with lime. MMMMM. We pretty much paid $9 per taco and it was worth it in every way for those two bites. The ceviche was good as well. 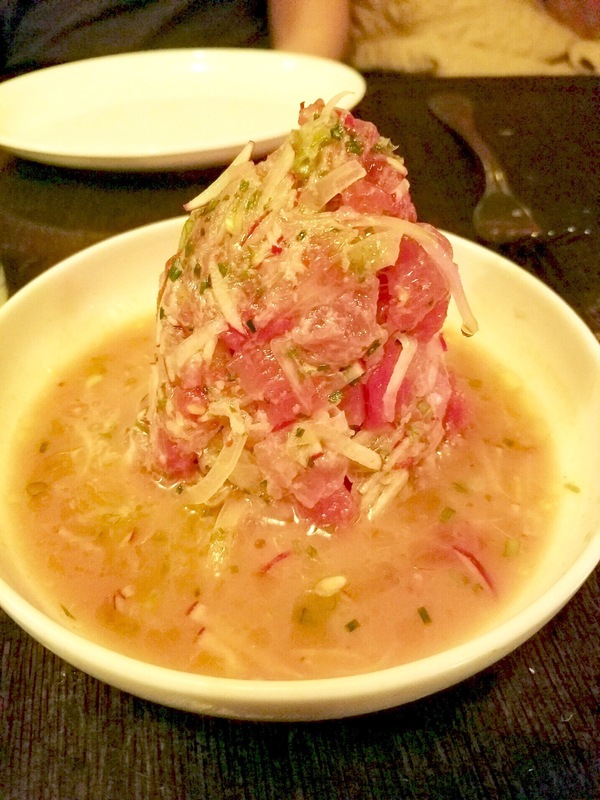 It was piled up similar to a tartare style, and it was definitely mixed with watermelon, onion, and radish. The watermelon gave a surprise mellow sweetness, which was balanced out by the bite of the onion. Matt gobbled it down even though he was hesitant to order it at first. For my entrée I decided on the Bacalao Trufado, which was cod dressed in a tequila sauce, served on top of a pile of corn and shimeji mushrooms, tossed with black truffle butter. Oh my gosh it was so good. 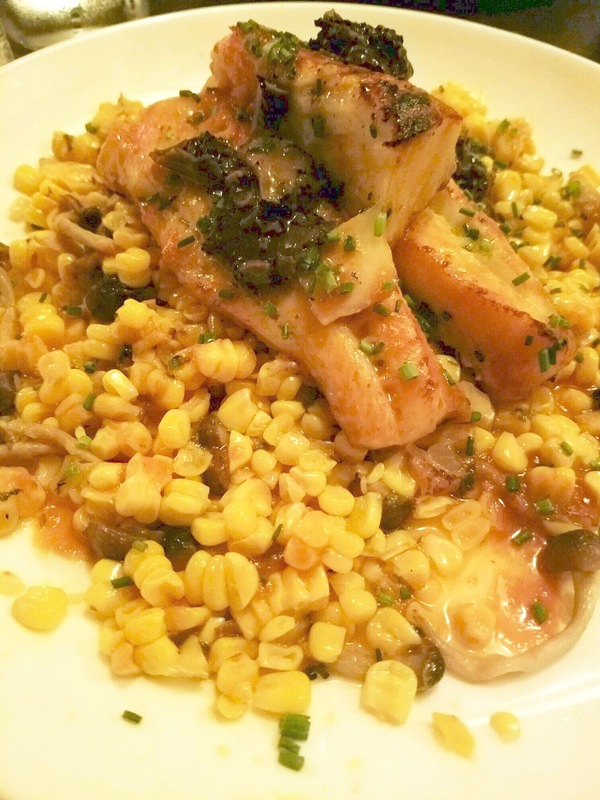 The corn was so buttery and sweet, and went so perfectly with the earthy mushrooms and truffles. The cod on top was so juicy and perfectly cooked, and was slightly salty which balanced out the sweet corn and tequila glaze. And it was a huge portion! I was stuffed by the time I finished! 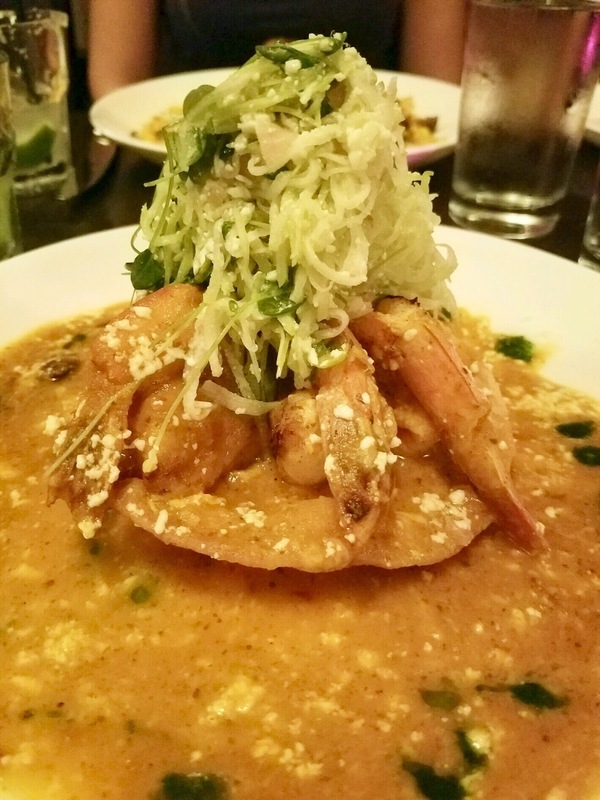 Matt opted for the Camerones Toloache, which was garlic shrimp on top of a crispy tortilla, piled high with a squash salad and swimming in a salsa sauce, topped with queso fresco. His meal was great as well and slightly smoky. His only complaint was trying to peel the tails off the shrimp (I had to show him how to do it without using his hands). By the time we finished our entrees we were stuffed and pleasantly warm from our margaritas. All was right with the world…. until we saw the bill of course. Two entrees, two appetizers, and two drinks set Matt back about $150, which isn’t the worst by NYC standards but certainly not the cheapest. However it was a great meal and a perfect spot to splurge a little. This place would be great for a first date or a birthday dinner (with ample margs). It gets 4/5 stars! Ariane, I’ve eaten at he one in Greenwich village a couple of times, I love the dish Matt had, one of my favorites in NYC!